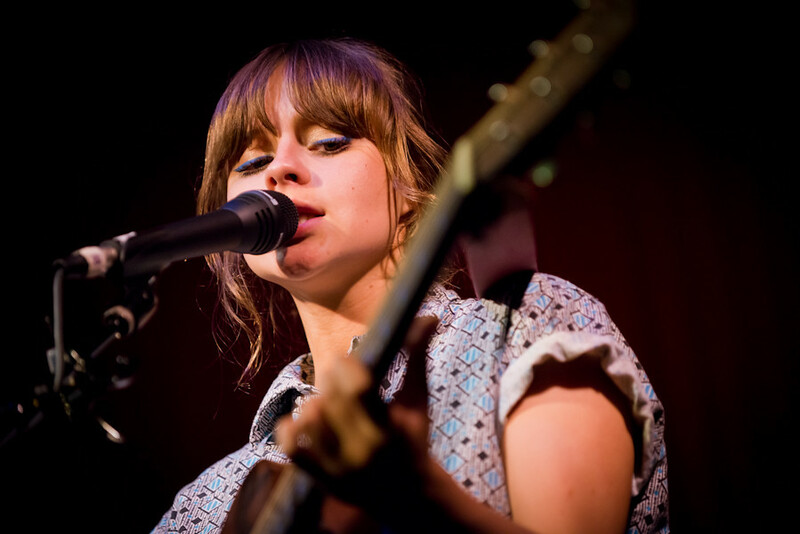 Gabrielle Aplin, the British songstress from across the pond has found massive success following her Gold-selling full-length debut album English Rain. Now, looking to continue her success on U.S. shores, the 21-year-old singer/songwriter has released her first U.S. debut - the 6-track EP English Rain which features five songs from her celebrated debut album of the same name. Well, it didn't take long for stateside music lovers to find Gabrielle. They welcomed her with open arms by selling out her first ever North American headlining tour including Los Angeles' famed Hotel Cafe. It was an early show (7pm) and very much packed in the very intimate Hotel Cafe, an ideal venue for Aplin's soft and delicate songs. Much, if not all, of English Rain delves into our vulnerabilities as individuals and how we deal with them. Either we succumb to the pressures of life or we triumph over the hardships we all face. Gabrielle Aplin, in her first Los Angeles show at the Hotel Cafe. Gabrielle pulls us in, mostly, with her captivating vocals, her charming personality and the rest with her talent for writing honest lyrics set to delicate acoustic guitar and piano. Whether it be themes of living in the moment in "Please Don't Say U Love Me" where she pleads "...fools rush in and I've been the fool before / This time I'm gonna slow it down because I think this could be more...the think I'm looking for," or in "How Do You Feel Today" about how our past haunts us to the point of not being able to looking ahead, Aplin's writing mirrors a life that is wise beyond her years, yet at only 21 years old, she's able to harness a lifetimes worth of heartbreak in her emotional lyrics. Take for instance "Panic Cord" detailing a one-sided relationship; one side realizing that the bond is slowly fading. "This meant more to you than it did to me, I was full of doubt and you believed the more that you keep coming over the more I know it's over..." . Although her melodies and lyrics often have a dark and hopeless undertone, there's glimmers of hope in all her songs. One of the standouts of the night was Aplin's stunning rendition of her favorite artist - Joni Mitchell's "A Case of You" which is also included on her English Rain EP. In fact, growing up in a self-confessed 'hippy' household where music was a family staple, Aplin noted Joni Mitchell as one of her inspirations. Aplin ended her set with "Home" - another Joni Mitchell-esque tune which also closes out her EP. Although she's already conquered the U.K. music charts (her full-length album peaked at #2 and her single "The Power of Love" launched to #1 in both the U.K. and Australia's iTunes charts), Aplin is set to make a name for herself in America. And judging by the reaction from the crowd and the fact that she sold out her first ever U.S. tour, Aplin proved this night that she is no longer Britain's best-kept secret. "Salvation" by Gabrielle Aplin off her new EP English Rain.